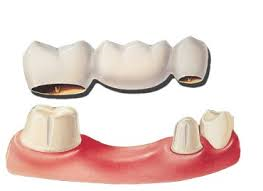 Bridges are the common term given to fixed dental prostheses. A bridge is a fixed method of replacing a missing tooth. Unlike partial dentures, a bridge cannot be removed from the mouth. A bridge is nothing more than individual crowns on the teeth adjacent to the space of the missing tooth with a prosthetic tooth permanently fixed to the adjacent crowns. The prosthetic tooth or teeth replace the missing dentition. The material of choice depends on many factors such as patient preference and available restorative space. Certain materials are stronger than others and certain materials are more aesthetic than others.